I was told by a leading balsa supplier (around 1990), that balsa supplied in the UK IS cut to metric dimensions. It's just labelled in inch units for the convenience of the olde English builder! i.e. if you buy 1/4 square balsa, it's actually 6mm square, and 3/16 is actually 5mm, etc. All the 2mm sheet that I buy is always oversize by 0.38mm ! 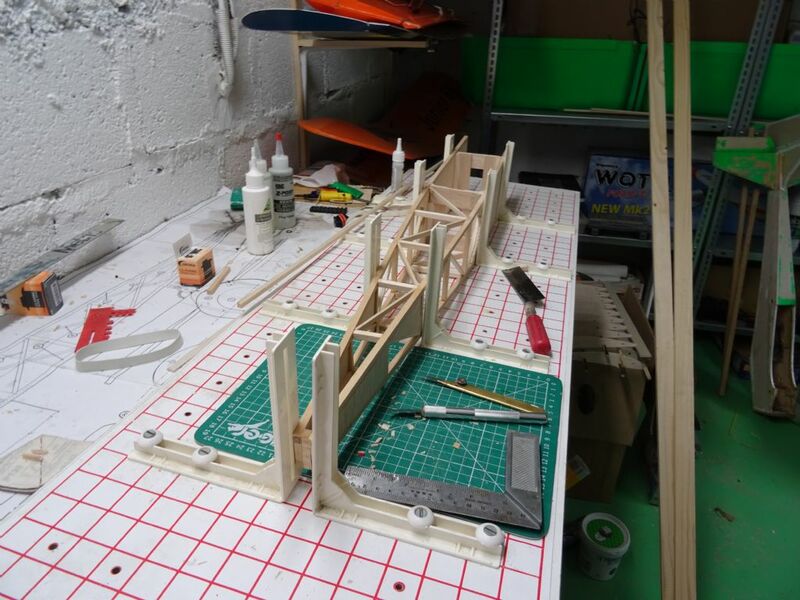 I have recently built this fuselage for a Baron which I plan to fly in a competition in September. The longerons are from 1/4" square basswood and the uprights and cross pieces are from 1/4 sq balsa, bought from SLEC. The front fuselage sheeting was bought from a French supplier. It purports to be 6mm thick balsa sheet but it proved to be rather thicker than the basswood and had to be sanded down to match. Could you speak to the short kit supplier and enquire where they sourced the material it was cut from? You won't get a better match! Balsa wood is an organic material and is not (cannot) be machined to such tolerances. It also changes with humidity and adjustments will have to be made during the construction process. It is what it is. Isn’t wood from a timber yard supplied in nominal sizes because of the natural variation in the wood? Mantua Models in Windsor supply both balsa and piano wire in metric sizes. The latter is particularly useful for replacing the bendy stuff used with some ARTF retracts. I just wish Imperial units were done away with altogether. It's probably only the US that seem to be resolutely sticking to the 20th (or even 19th) century. I admit I have a few problem with some metric units (wing loading and bike frame sizes to mention 2) but that's because I'm old. I use almost exclusively metric threads and dimensions otherwise. I had difficulty acquiring metric sized brass tubing when I made the Gordon Whitehead designed undercarriage for my DB Gypsy Moth. As far as I know all wood, whatever type it may be, is cut to imperial sizes in the UK because that is what the machines are set to. Timber generally comes in imperial lengths etc so if you want 2m from an eight foot plank then you pay for the eight feet. An 8x4 ft sheet is still 8x4 whatever the nearest metric equivalent may be. When I built my modelling shed some years ago I wrongly assumed that everything must by then have been metric. Put the hardboard battens at 1m only to discover that white faced board was still 6x2. Can be frustrating when building a model from a plan because the CAD drawing is invariably in metric now but the balsa is not. It can often make a very big difference. Do you honestly think you will get exact metric, or indeed imperial. If you are that fussy, cut it yourself, or sand it yourself. Not sarcastic. I live in France. The stuff I buy in France is no more metric than the stuff I buy from SLEC is imperial. Manufacturing tolerances are going play a big part in all this. Or keep moving to world standards. I'm on the hunt for a 1/4" x 5/8" strip which I guess I'll have to cut myself as I haven't been able to find that size. What is the model by the way? I concur with the above opinions, balsa is only ever approximately the size you order. If you have slots in laser cut ribs and whatnot, which need other stuff slotted in, I would suggest making yourself a slot sander and just opening up the slots a bit. Permagrit will sell you an expensive one, but I've only ever cut short (maybe 6" at most) strips of paper and stuck them to bits of hard scrap balsa the right width. Then trim the paper if it overhangs. One of the great things about balsa is that it is so soft you can knock up all sorts of sanding widgets in no time at all, to get repeatable angles and bevels and slots and whatnot.